Taormina Italy Hotels. 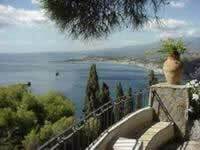 Taormina hotels bed breakfast residence holiday villas accommodation in Taormina. A glamorous place, known all over the world for its archaeological sites, Taormina has a panoramic position affording a marvellous view of Mount Etna from the Greek theatre which lies on the spur of Monte Tauro. Hotel Palladio is located in the historic side of Giardini Naxos, near to the sea. This pretty family managed Hotel is a refurbished residential building. An elegant 4-star hotel, Villa Paradiso is situated on a cliff in Taormina, completely surrounded by the sea. The hotel's privileged location allows the guests to enjoy spectacular views of the fantastic Giardini Naxos Bay and of Isola Bella. Find the ideal hotel for your holiday in the seaside resort of Taormina! Check our special seaside offers for Taormina: choose your hotel with a sea view for your next summer holidays by checking the hotel and accomodation list in our guide. Treat yourself to one of Taormina's hotels with a private beach, a few steps from the sea or choose to stay in a hotel in Taormina with a swimming pool by the sea. Use our guide to book one of the hotels in Taormina which provide rooms with a view of the sea. Look on the map for hotels close to the sea and the beach in Taormina. Hotels with parking in Taormina ? If you have decided to travel to Taormina by car or motorbike, don't worry about finding a parking space or leaving your vehicle unattended. Display the list of hotels and accomodation in Taormina provided with a parking place or a garage. Book a hotel in Taormina with a parking area! Pet-friendly hotels in Taormina ? Don't leave your dog at home. Use our guide to check the list of hotels and accomodation that welcome dogs in Taormina. It is also possible, from our selected list of hotels and accomodation where animals are allowed in Taormina, to keep your dog in the room with you! Check our offers of hotels and accomodation in Taormina with rooms equipped for the disabled! For your stay in Taormina, book a hotel accessible to disabled people. Choose your hotel in Taormina from the list of hotels equipped to welcome disabled people! Wi-Fi hotels in Taormina ? Are you looking for a hotel or accomodation with a quick internet access and wi.fi? Click on the list of hotels in Taormina which have a wireless connection to internet and wi.fi. Gay-friendly hotels in Taormina ? Look for gay friendly hotels or gay friendly accomodation in Taormina, choose to sleep in a gay friendly hotel or gay friendly accomodation in Taormina! Take advantage of our offers of gay friendly hotels or gay friendly accomodation to book your holidays in Taormina.